Following David Greenhalgh’s article on the subject a few days ago, Paul Truswell responds with some thoughts of his own. 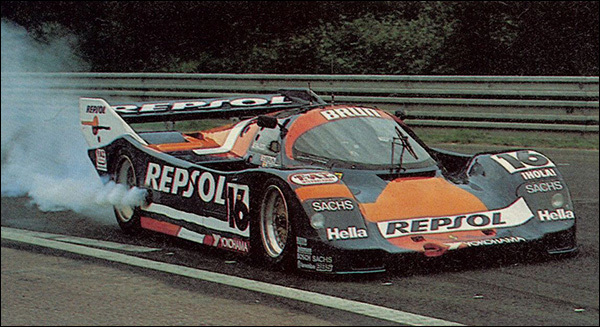 In looking at famous “last laps” at Le Mans, David Greenhalgh omitted to mention a case that has not been spoken of until relatively recently; namely Jan Lammers’ efforts in the Jaguar XJR-9LM in 1988, when he drove the car for more than an hour using only fourth gear, the rest of the gearbox having fallen apart – and the canny Dutchman aware that another gearchange would leave the car with no drive at all. In some ways, maybe the Jag was not a last lap special, in the spirit of David’s article, but nevertheless it was a car that was very definitely on its last legs; and a story that you can hear Jan himself tell in Definition Media’s under-rated DVD “The Jaguar’s Roar”. The nature of the 24 hour grind lends itself to many tales of teams struggling to the finish, owing partly to the rule that to be classified, you have to cross the finish line after the chequered flag is shown but also partly to the need to achieve closure on the event merely by seeing the chequered flag even if one is so far behind that you are anyway unclassified: at least you are a finisher. The rule is one that is common in endurance races – although it is not universal – but undoubtedly it encourages such last lap heroics. It wasn’t always so. For example, as recently as 1992, when Le Mans counted as a round of the World Sportscar Championship, FIA rules applied, and cars were classified according to the number of laps completed, regardless of whether they were still running at the end of 24 hours. If only that had been the case in 1990, when poor old Jesus Pareja’s Brun Porsche broke down with less than 15 minutes of the race remaining… he had completed a sufficient number of laps to be classified in 2nd place, regardless of the efforts of the second TWR Jaguar in the hands, funnily enough, of Jan Lammers. 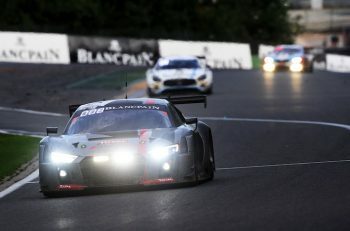 What is particularly bizarre is that between 1967 and 2004, with one or two exceptions, the last lap of the Le Mans 24 hours didn’t even count. Find an old results sheet and you’ll see that the official time elapsed for the race is nearly always less than 24 hours. János Wimpffen, in his seminal and exhaustive tome, Time and Two Seats, is forced to show a different number of laps completed for the race distance than the number of laps covered by the leader! It’s all because the ACO, in somewhat arcane fashion, has always tried to stress the fact that it is the distance of their race that is variable, rather than its duration; again, look back at the archives and you’ll see that the distance covered is not an exact multiple of the circuit length. How can that happen? Well it can’t, of course, but the ACO constructed a method of calculation to make it so. The average speed of the last three laps was taken to calculate the distance around the final lap that the cars would have travelled, up to the moment when exactly 24 hours had elapsed. Only since 2005 have the official results been posted in the ‘normal’ format, showing the distance completed as a complete number of laps, and the elapsed time of the race as something slightly over 24 hours. A record distance should really rather therefore be measured in terms of a record average speed, but that is probably getting too picky. It is rare for such things to be important, but of course many people will recall the fuss over the attempted staged dead heat between the two Fords in 1966. Bruce McLaren, winner on the road, would have been awarded victory in the case of a dead heat across the finish line, by virtue of having started two slots behind Ken Miles at the start. And in 1994, there was a splendid battle for second place in the closing stages of the race, as Eddie Irvine in the Toyota 94CV, closed in on Thierry Boutsen in the second of the Reinhold Joest-run Dauer Porsches. Two hours earlier, the Toyota had looked a likely winner, but had encountered gearbox problems while Jeff Krosnoff was driving, and had fallen back to third. A couple of minutes before four o’clock, and Yannick Dalmas in the leading Dauer Porsche was heading up to Tertre Rouge with a lap advantage and safe in the knowledge that by the time he reached the start-finish line the chequered flag would be waiting for him. Meanwhile, Irvine was on the tail of Thierry Boutsen’s Shell-sponsored Porsche as the two cars threaded their way through the walking wounded, at the end of their 343rd lap. Irvine made his move as they negotiated the Ford Chicane, and crossed the line just under a second ahead of the Porsche, according to my hand-timing from my vantage point in the tribune. Would he be able to hold on through the final lap? Dalmas duly took the chequered flag and with it his second win at Le Mans but attention soon went back to the line of traffic that was coming into view out of the Porsche Curves. Boutsen was right with Irvine as the Toyota and Porsche battled their way through the traffic (including Derek Bell, in the Gulf Kremer K8) as the chequered flag waved. So close were they that Boutsen actually overtook Irvine as they slowed before being waved into parc fermé at the end of the pit straight, and it looked like one of the closest finishes for a podium place in the history of the race. 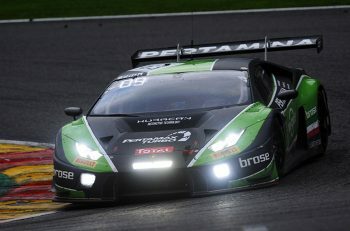 However, when the official results were issued, showing Irvine and Boutsen each on 343 laps, the gap was listed as 2.52 seconds, and the official distance between the two cars 144 metres. What had happened? Some gap in the time-space continuum? Well no, what you need to remember was that Irvine had been six seconds adrift of the Porsche at the end of 340 laps, so his average lap time for those last three laps put him further ahead on calculated distance than he had ever actually been in fact, and Boutsen’s efforts on what he thought was the final lap, were all for nothing. Although if the positions had been reversed when the cars had crossed the line under the chequered flag, I am sure that something would have been done – indeed would have had to have been done! If the attempt to stage-manage the finish for the sake of Ford’s publicity photos in 1966 back-fired somewhat (at the expense, at least, of Ken Miles and Denny Hulme), it became something of a tradition from the 1980’s onwards, to arrange teams’ cars together on the track in the closing stages in order that they could cross the line in formation. However, as the ACO was also in the habit of pulling the cars off the track at the end of the start-finish line (due, in no small part to spectators spilling onto the track at the end of the race), there also became a habit of the winning cars slowing down on their final lap, treating is as a ‘tour d’honneur’ around to the chequered flag. This became particularly dangerous when other cars were scrapping over minor placings (or in the case of Irvine and Boutsen in 1994 – a podium position). On a couple of occasions in the early 2000’s, GT cars had to force their way past touring prototypes as they were involved in mighty races of their own for class positions. Hence, for the 2007 race, the rule referred to in David Greenhalgh’s article was introduced that the final lap had to be completed in less than six minutes (except in cases of force majeure). 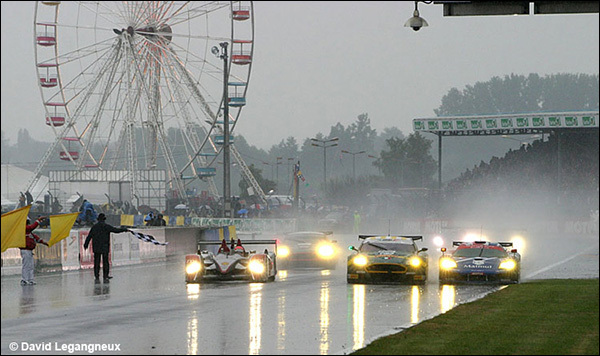 Unfortunately, the final hours of that year’s race saw a typical Le Mans deluge. Safety cars were sent out to neutralise the race, and were only withdrawn with a little more than ten minutes of the race remaining. The number 8 Peugeot 908, with severe engine problems, had spent nearly 23 minutes in the pits in that final hour, and was sent out again with Sebastien Bourdais at the wheel for the final 20 minutes. The Frenchman arrived at the Ford Chicane to complete his 359th lap a minute before three o’clock, but the engine telemetry was telling him that the Peugeot wouldn’t be able to complete another 13.6km, so he pulled to the left of the track, well off the racing line, to await the arrival of Marco Werner’s winning Audi R10 TDI. As soon as the Audi was past, Bourdais trundled across the line, taking a rather distant second place, but having completed one lap more than the better of the two Pescarolos. Bourdais’s lap time for that final tour? 10m 56.110s! Marco Werner in the Audi had taken 7m 05.632s to complete his final lap though, so that stewards of the ACO had something of a dilemma on their hands. Pragmatism won the day, and the results were allowed to stand – force majeure being declared. In the weeks after the race, the ACO issued a statement, clarifying their ‘soft’ response to some of the Supplementary Regulations, in which they said in specific response to criticism of the treatment of article 84 (my translation): “the rule was intended to prevent the winners’ cars making an endless ‘victory lap’ before the end of the race”. The question of “stopping on the track to wait for the chequered flag” was conveniently overlooked – the statement stating simply that in the case of the Peugeot, attempting to complete another lap would have incurred “too many difficulties and risks”. Over the years, various means of classification have been used at Le Mans and at other 24 hour races. But in the final analysis, it is the character and nature of the team itself – or the stubbornness of the team management – that ultimately dictates the effort that will be made to be there at the end. One thing is for sure, the drama of the closing stages of Le Mans is just as great as that of the opening laps.